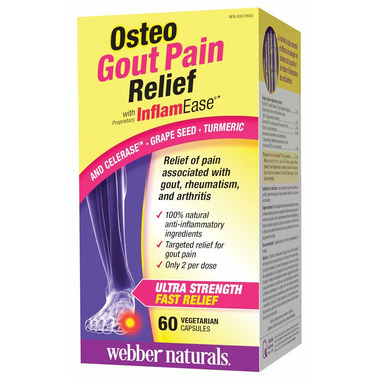 Osteo Gout Pain Relief from Webber Naturals contains standardized extracts of turmeric, celery seed, and grape seed, alongside sweet cherry concentrate, vitamin C, and ultra fruit blend from InflamEase. This innovative plant-based formula offers a natural way to reduce pain associated with gout. Recommended dosage: 2 capsules daily or as directed by a physician. Proprietary fruit blend of: Grape (Vitis vinifera), Pomegranate (Punica granatum), Strawberry (Fragaria vesca), Cranberry (Vaccinium macrocarpon), Blueberry (Vaccinium corymbosum), Raspberry (Rubus idaeus), Bilberry (Vaccinium myrtillus). Consult a physician prior to use if you have diabetes, a renal disorder, gallstones, a bile duct obstruction, stomach ulcers, excess stomach acid, or if you are taking antiplatelet medication, blood thinners or any prescription medication. Consult a physician if symptoms persist or worsen. Do not use if you are pregnant or breastfeeding or if you are allergic to plants of the Umbelliferae (carrot, celery) family. Sensitive individuals may experience allergic reactions. Celery seed may increase UV light sensitivity; limit exposure to ultraviolet rays (e.g., sunbathing or tanning salons) for prolonged periods while using this product. Keep out of reach of children.